Home News Gbetu Tv: See the 2016 list of 100 Most Influential Young Kenyans by Avance Media. 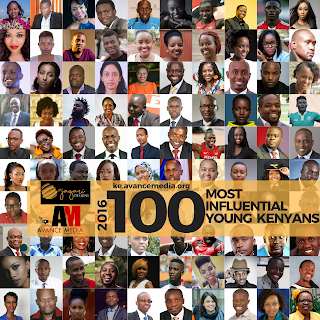 Gbetu Tv: See the 2016 list of 100 Most Influential Young Kenyans by Avance Media. The Avance Media in partnership with Jagari Designs have announced their inaugural list of 100 Most Influential Young Kenyans. In rating who becomes the 2016 Most Influential Young Kenyan, the general public is being invited to vote for their most impactful youth on ke.avancemedia.org . Avance Media is a reputed rating establishment and Africa’s leading Media and PR firm.